My family looks forward to the Grasshopper Pie I made every 4th of July. 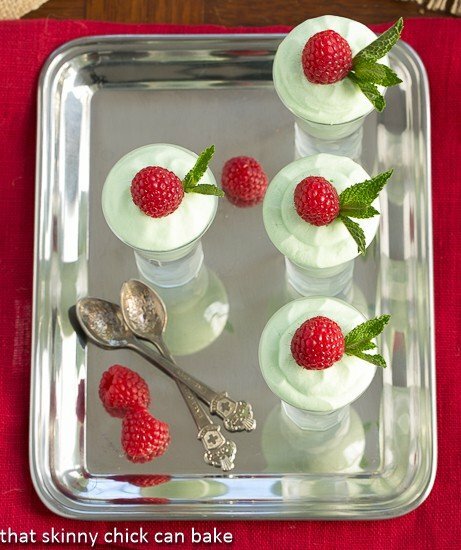 So for this year’s St. Patrick’s Day, I tried my hand at this minty, dreamy Easy Grasshopper Mousse. Tomorrow is St. Patrick’s Day and some of my blogger friends are sharing some green desserts in honor of this holiday. My 4 foot 8-inch Irish great-grandmother, after whom I was named, was a marvel in the kitchen, and famous for her homemade spicy pickles, roast duck, walnut bread and even her New England boiled dinners. Pretty exotic for North Dakota, eh? One of my mom’s favorite memories of her cherished grandmother was practicing to knead bread on her fleshy arms. I DO come from a family of foodies! So today, I dedicate this Grasshopper Mousse to “Dama.” I’m certain her spirit is always with me in the kitchen. The grasshopper cocktail originated in the French Quarter of New Orleans in the 1950’s and was equal parts creme de menthe, creme de cacao and cream. My family (well, except for the mint eschewing husband) adores my grasshopper pie, so a mousse version of the beloved grasshopper seemed apropos for the holiday. 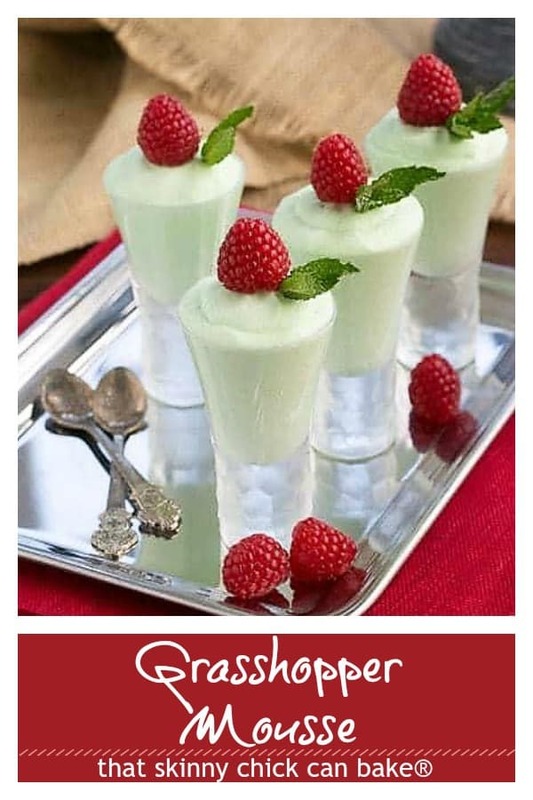 These Grasshopper/Shamrock Shooters are also a fun, festive treat! I like to use the microwave to melt my chocolates. It must be done slowly and carefully so the chocolate doesn’t get overheated. I stop to stir every 30 seconds until only small bits of unmelted chocolate remain. The residual heat should take care of those. 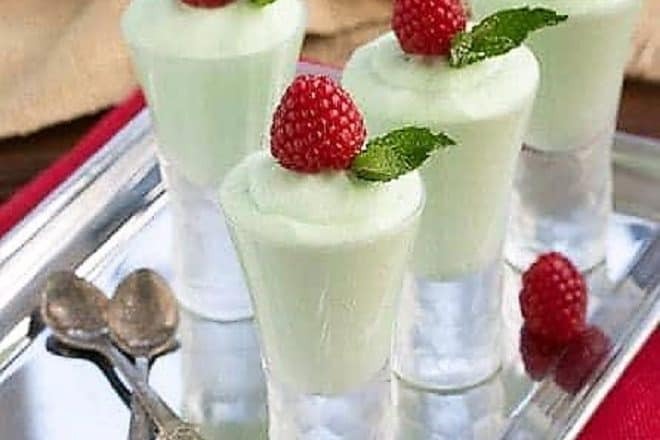 It’s not necessary to add food coloring to enhance the green color, but if you want to make it festive for St. Patrick’s Day, you may want to consider the addition. Note that there is a raw egg white in this recipe. 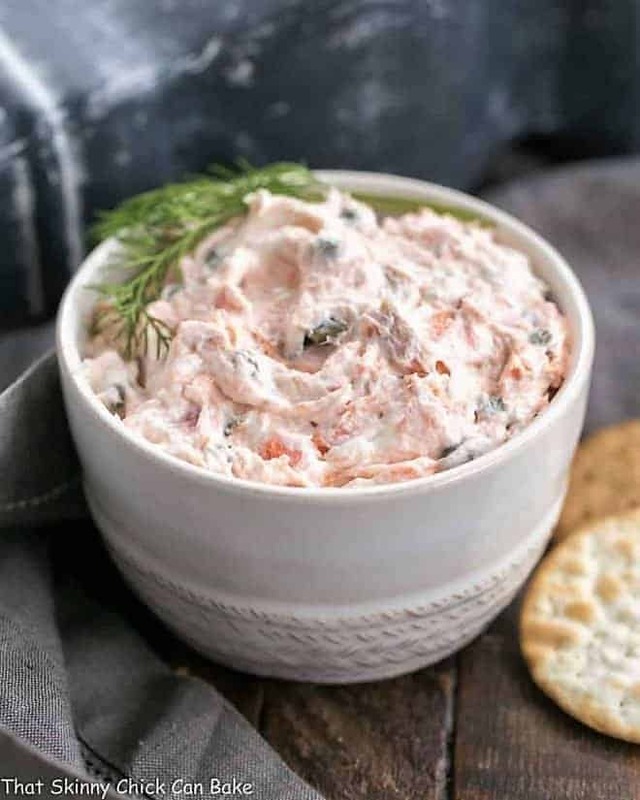 PRO-Tip: Use a pasteurized egg if you’re serving this dessert to young children, the elderly or immune suppressed to minimize the chance of salmonella contamination, which causes a food borne illness. To make this dessert even more sublime, white chocolate was thrown into the mix. My mint fans swooned over this 5-ingredient grasshopper mousse. I’m sure you will, too. Some other St. Patrick’s Day dessert from the blog include this Chocolate Guinness Cake, Creme de Menthe Cake, Shamrock Shooters, and this Key Lime Pie! In a microwave safe bowl, melt white chocolate with ¼ cup of the heavy cream, stopping and stirring at 30-second intervals till smooth. Set aside to cool. Whip remaining ¾ cup heavy cream to soft peaks. Fold a large spoonful of whipped cream into cooled chocolate. 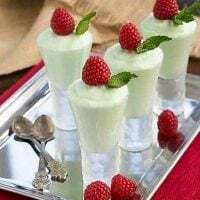 Gently in creme de menthe, egg white and a few drops of green food coloring, if using. Pipe or spoon into serving dishes of your choice. Chill an hour or more before serving. Garnish with mint leaves and/or raspberries, if desired. Inspired by Nigella Lawson.Total time does not include chilling time. Note: There is one raw egg white in this recipe. If you are leery of eating raw eggs, as you should be due to the risk of a contracting a foodborne illness, please use a pasteurized egg, now available at many supermarkets. These look amazing! I am SUCH a mint fan and eat it year-round, but I love that it gets special treatment on St. Patrick’s Day. Beautiful photos too, Liz! Beautiful mousse! As another mint fan, I know I’d swoon over this too. Happy St. Patty’s Day! Love the way this mousse looks! And I bet I’d love how it tastes even more! I’ll have to work a virgin version of this dessert because my daughter’s favorite flavors is mint. It looks refreshing and those pictures are absolutely beautiful. Thanks for participating. 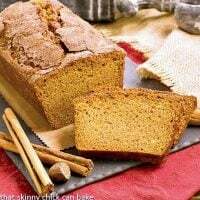 BTW Do hope you share your great-grandma’s walnut bread. Bet it is fantabulous! Such a classy recipe Lizzy! Perfect for St. Patrick’s Day! And, as always, beautiful photographs! Oh yum! Although forget raspberries. I’d be “garnishing” these with CHOCOLATE! 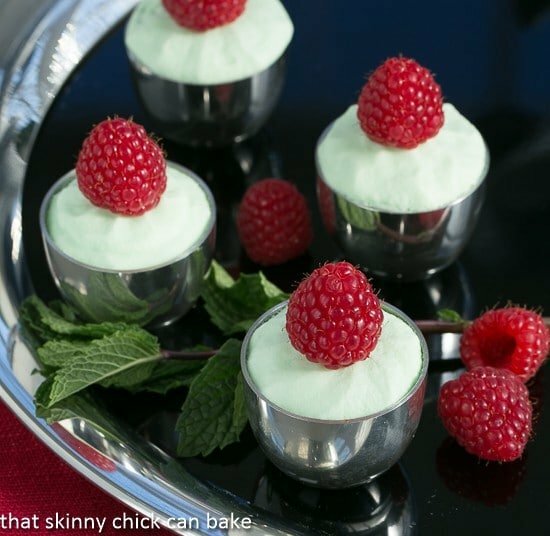 creamy mint desserts make me swoon, Liz! This mousse looks amazing… PINNED! I’m sure you would have made Dama proud! This mousse works for me on so many levels! Wow Liz! these are just gorgeous! I love it with the white chocolate! It looks delish! I don’t think I could share these and I would just eat them all! I want one of these…now! 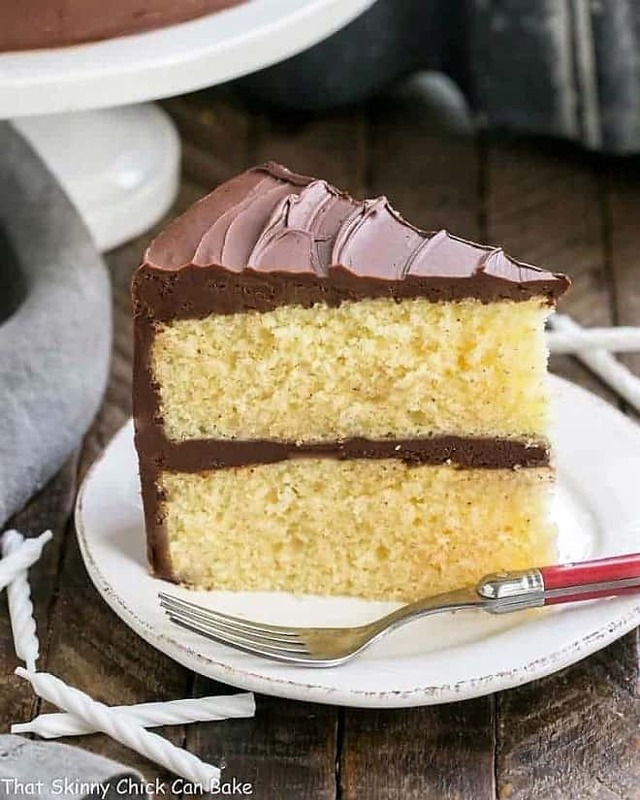 Gorgeous and tasty…love it, Liz! Thank you so much for sharing all the Green, Liz…Happy St. Patrick’s Day! Looks delicious! Reminds me of the Frango Mints we used to get from Marshall Field’s when it was still open here in Chicago. Thanks for sharing! omg your great gma sounds so cute!!! and I looove this pretty minty mousse!! How pretty, Liz! If only Patrick’s Day was more than once a year! So pretty – a perfect spring dessert! Happy St. Patrick’s Day! 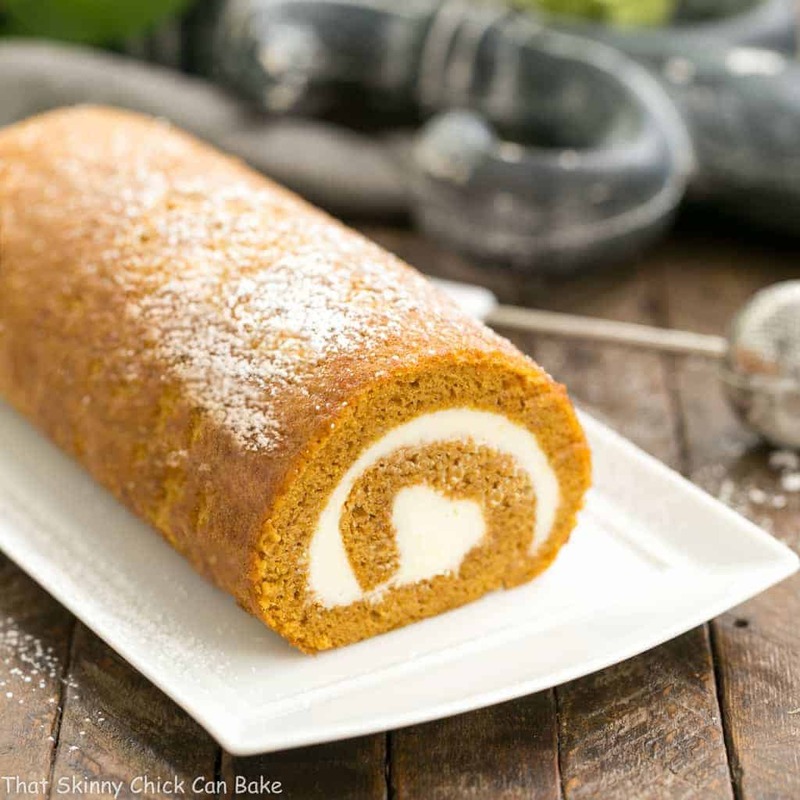 This is a holiday I have so much trouble creating dishes for…I don’t think I have one speck of Irish in me. 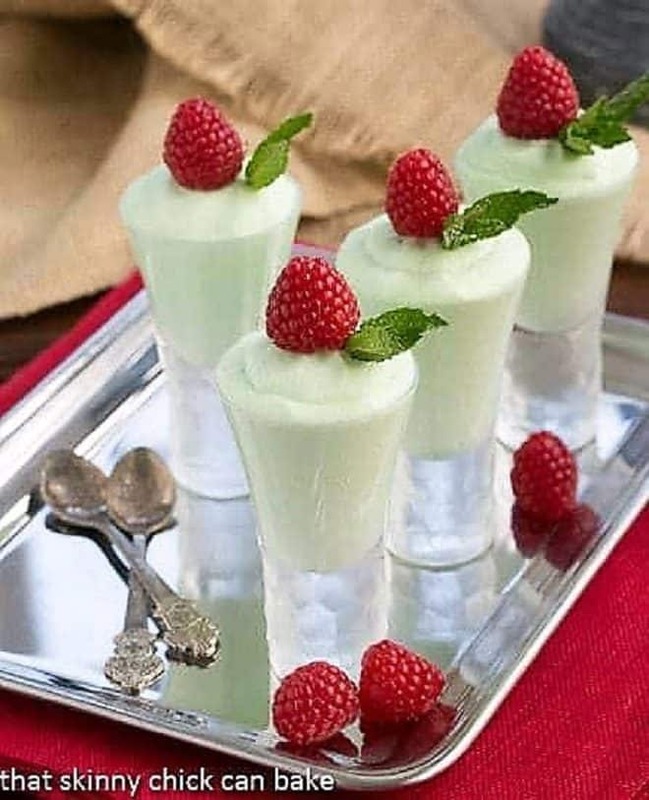 This is so pretty and the mint flavor sounds wonderful! I love pasteurized eggs. They are pretty much all I buy any more. I’m swooning, I’m swooning! I love the bit of white chocolate in it just to make it even more special. Your Dama would be very proud of you, very proud indeed. ohmygoodness this sounds wonderful. And what a beautiful color. I’m having company for dinner and I sure wish I could serve these for dessert. Next time, because I don’t want to run to the store again. 🙂 Pinned. That is pretty adventurous for North Dakota – I’m from Montana and can tell you I never had this growing up! I can’t wait to try this – it looks so beautiful, flight, fluffy and delectable. What a lovely tribute to your grandmother Liz! The green treat is perfect for the celebrations tomorrow, Happy St. Paddy’s Day to you too! Yum! This reminds me of the filling for the pie I just made (posting about it tomorrow! ), looks awesome. Yum! Grasshopper anything is delicious…love that minty green color too! My Oh My…you have come up with the PERFECT green recipe. It looks like a cloud of heaven!! Well isn’t this fun and so perfect for the occasion. Love the recipe! What a beautiful mousse! I love white chocolate and this is a very nice treat on St. Patrick’s Day!! You never cease to amaze me with your decadent desserts. You really know how to make something so simple, turn out to be so elegant. Love this dessert. Perfect for St. Patrick’s Day or any day for that matter. You did come from a family of foodies. Could you make the spicy pickles soon? I am smitten with that gorgeous green! Irresistible! WOW Liz you’ve out done yourself! 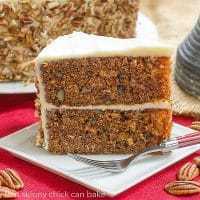 Great recipe and great pics! Happy St. Patty’s Day! I love these, perfect for St. Patty’s Day! Oh, I have to make it, it sounds and looks delicious! Happy St. Patrick’s Day Liz! This mousse looks awesome!!! My MIL turned me on to grasshoppers back in high school and I’ve love them and that flavor every since. Oh my goodness this mousse looks so good. It has been way too long since I had homemade mousse. Haven’t had a grasshopper in ages! This mousse looks like it’ll go down real smooth! I love all the minty things and what a lovely mousse. I just made a chocolate mousse from Nigella yesterday and used mini marshmallows instead of eggs. It works beautifully! your Dama sounds like a fabulous woman! and your grasshopper mousse looks perfect. How did you get it scooped out so perfectly? Mine gets so messy. And did you use shot glasses in that first photo? if so, that’s like the perfect size!! love it Liz! Any day of the week and for any holiday I would enjoy this! Oh my gosh, Liz, what beautiful mousses! I love your photos, always. And the green color in these is just beautiful! Oh Liz, my Antoine is like your Bill when it comes to mint. He keeps saying the French don’t like it and besides, it stops you from sleeping. Yeh, right. 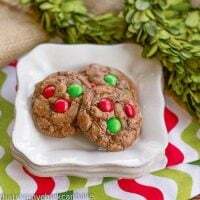 These look so tempting I’ll make them just for myself and the family can watch me! Missed St Patricks but need to make this. How beautiful! Sounds beyond delicious! loving the festive Shooter for St Patricks Day! I am down for anything grasshopper flavored and this was just perfect for a recent dinner party. Thank you! 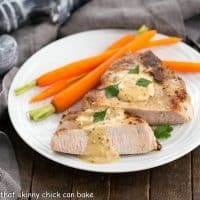 This recipe was perfect! I loved the creamy texture of this grasshopper mousse!